Appearances can be misleading. Unfortunately, such was the case with Arvixe. What looked like a good hosting deal, turned out to be something decidedly less. Arvixe provides low-cost shared Linux hosting plans that include a range of attractive features. Set up was quick and easy. However, our 10-day uptime test resulted in a reliability score of only 98.7186%. Further, speed testing results were less than ideal. A web browser required an average of 4.7209 seconds to load our simple 1-page test site (click for sample test site). In summary, the speed and reliability of Arvixe’s Personal Class plan were disappointing. On balance Arvixe has earned the NCM Online designation of NOT RECOMMENDED. At only $5.00 per month for the annual plan, the Personal Class is the cheapest Arvixe offering. It provides hosting for up to 6 domains. Priced at $8.00 per month for the annual plan, the Personal Class Pro adds the ability to host an unlimited number of domains. Both offer upgrade options that include dedicated IP address ($2.00 per month) and SSL certificate ($25.00 per year). In addition to shared hosting plans, Arvixe offers business class, VPS (virtual private server), dedicated server, and reseller hosting plans. All plans are available with either Linux or Windows operating systems. We purchased the Personal Class shared Linux plan. Our hosting experience with Arvixe got off to a very good start. The sign-up process was straightforward. The 20% coupon code discount was immediately applied and deducted from the plainly visible total due amount. In addition to MasterCard, Visa, American Express, and Discover; payment options included PayPal, Google Wallet, and Skrill. Within 5 minutes of sign up, we received our “welcome” e-mail that provided all of the details required to set up hosting, including nameserver and FTP information. 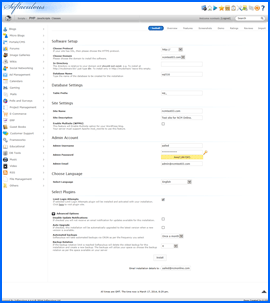 Upon logging into our account, we were pleased to see the familiar and easy-to-use cPanel control panel, as well as the Softaculous 1-click script installer (screenshot above right). We had our single-page test site (click for sample test site) up and running within minutes. So far so good. Arvixe Uptime Test Results Chart. Click to enlarge. Pleased with our purchase, we moved on to other matters, while our speed and uptime test data began to accumulate. Unfortunately, that was the point at which things took a turn for the worse. Early testing reports showed intermittent reliability problems on both March 6th and 7th (see screenshot right). 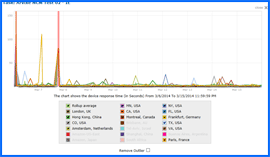 In all, 31 attempts to reach the server from various locations worldwide failed. The errors were mostly DNS related (error code 12007), although there were TCP (error code 10060) and HTTP (error code 12002) errors as well. While reliability testing continued until March 15th without additional incidents, Arvixe did experience the same error types on March 22nd and 23rd — after our testing had officially ended. Arvixe Speed Test Results Chart. Click to enlarge. While we prefer not to dwell on negatives, Arvixe speed test results were not much better (see screenshot right). 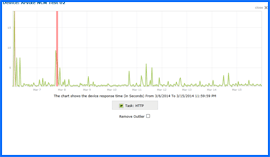 While downtime negatively impacted page-load speed averages, results during uptime were less than impressive. All web hosting services reviewed by NCM Online are purchased and subjected to our 10-day test for uptime and speed. Tested for uptime every 15 minutes over 10 days, Arvixe produced a lowly 98.7186% reliability score, and recorded an average speed of 4.7209 seconds to load our NCM Test Site from 13 locations worldwide, and 4.0429 seconds from 7 U.S. locations. If we were to omit the two days of testing during which time the server experienced uptime problems, page-load speed averaged a disappointing 1.8297 seconds from 13 locations worldwide, and 1.3909 seconds from the 7 U.S. locations. Despite the number of positive aspects, Arvixe’s inexpensive Personal Class plan disappointed us. The below-average results of the uptime and speed tests leave us little option other than to say there are faster and more reliable hosts in the same price range. Arvixe has earned 3.5 stars and is not recommended by NCM Online. Cheap website hosting company price comparisons based on 1-year term list price before coupon/promo codes or limited time/introductory offer discounts. These are the renewal rates for the second year of hosting. To ensure that you receive the most affordable Arvixe pricing possible, please visit our Web Hosting Coupon Codes page for current discounts and special offers before making any purchases. Arvixe is a privately owned corporation located in San Luis Obispo, CA. Globally, Arvixe has hosted over thousands of small business, individual and enterprise websites. This is since the year 2003. It has been receiving many awards from other companies like Host-review and Inc. Magazine since its commencement. The reason being, it is a very fast growing hosting company globally. 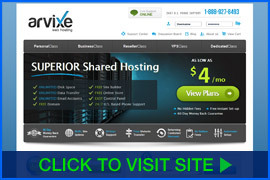 Arvixe provides reliable, quality and affordable web hosting services. This is as a result of better management of the company and employees who have the initiative to work and deliver the services. Their aim is to ensure they work hand in hand with the client and enhance their trustworthiness in the business by delivering extraordinary quality services and offering their support in any matter. As time goes by, Arvixe have expectations of accomplishing best affordable prices of products by partnering with other hosting companies and good management of the company. Clients can be provided with their demands at the least prices possible without any kind of negotiation and hitches in the process. There are many SAS 70 Type II data centers that are certified situated in Chicago, New Jersey, and Dallas. Arvixe has a system of power management. There is backup power in case there are unexpected power cuts which are installed by the generator architecture. It supplies enough data center power to heating, ventilation and air conditioning and other servers. Therefore clients are assured of power sustainability throughout. Arvixe Data Centers have an Uninterrupted Power Supply (UPS) that delivers power to many individual servers. It takes power that is raw from a utility and controls it before it’s supplied to the servers. The UPS is meant to avoid server performance from being affected by power cuts. The UPS system in Arvixe Data Centers only supplies power to servers or other systems in the buildings like air conditioning and ventilation when the power flows from the local service to the system. Generators are set to automatically start when power has been disturbed. For any applications that are hosted, the Arvixe has a speed network that removes any kind of signal processing blocks and jams assuring very quick responses. This is done by using direct internet connections which reduces the distance between websites and visitors. The ultimate result from this is extreme speed with high dependability and effectiveness. Arvixe has taken keen considerations in a building that was constructed with one of greatest innovative network routing in the hosting industry. It works in many layers with a full capacity having many core routers, core circulation switches and carrier range. Arvixe provides enough centralized monitoring of networks services in every city from the Network Operations Center (NOC). It is certified to offer any support while quickly responding to network difficulty. NOC is designed to automatically transfer its operations in case a problem occurs to it. These operations are being transferred before the problem reveals itself. The company strives to provide security, reliance, quality performance and availability of systems at the highest peak and performance. This video tutorial demonstrates the installation of WordPress on an Arvixe shared hosting account using cPanel and the Softaculous 1-click installer.